Mission Statement Keep Sedona Beautiful, Inc., through the stewardship of its members and volunteers, is committed to protect and sustain the unique scenic beauty and natural environment of the Greater Sedona Ara. We all realize trash and litter on our roadways doesn’t just disappear. Dedicated volunteers have removed litter since 1971 to the benefit of residents and visitors alike. 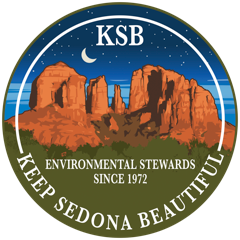 Keep Sedona Beautiful (KSB) has played a key role in making sure litter is removed, adopting some 70 miles of our roads and highways. Our community need is immediate and urgent, to cover litter lifter vacancies. You can help by calling KSB at 928-282-4938 or emailing ksb@keepsedonabeautiful.org to learn more, and discuss this rewarding work. All equipment is provided. Temporary positions and route sharing or partnering options are also available. KSB is in need of volunteer painters to paint a recently sanded outside deck with two coats of paint. Only one top rail will need painting. Materials supplied, just show up and paint! One side of our building needs to be scraped and painted. This is a small job, lots of windows reduce areas needing paint. Materials supplied.